In 2005 Beam Camp started building spectacular projects on a foundation of relationships between youth and creative and technical experts. Today, as Beam Center we bring our values of collaboration, skill development, and mentorship into NYC’s diverse classrooms and communities. We believe that hard problems are best solved in deep conversation and collaboration. 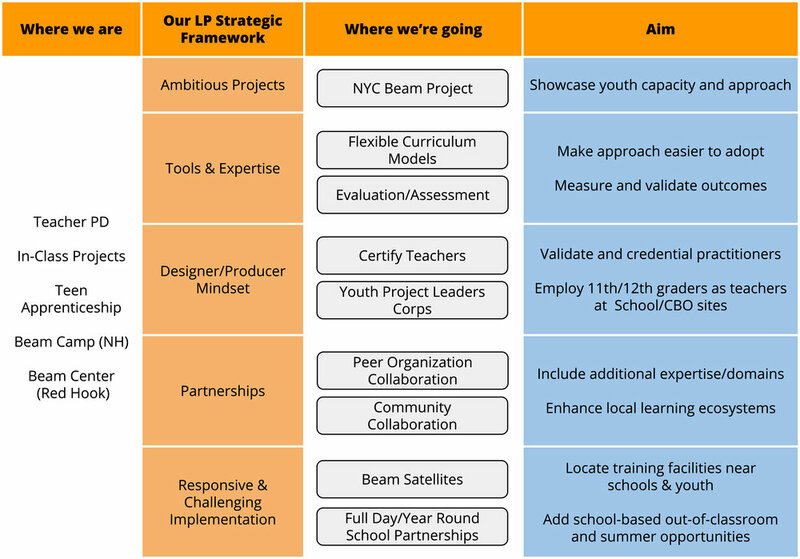 Like our Beam Projects, we designed this strategic plan iteratively, mixing expertise, lessons from the field and a user-centered lens that prioritizes learning from our youth and our partners. Our inclusive strategic planning process involved our Board, full staff, Beam youth, educators, and community partners and reflects our core values of challenge, responsiveness, and radical trust . This strategic plan will guide Beam Center to grow sustainably, maximize our direct positive influence on youth, and expand our cutting-edge approach to help many more youth achieve their dreams. Beam Center is poised for great potential growth in terms of scale and size. This strategic plan represents a dedicated effort to chart our course intentionally to maximize our positive impact on youth for many years to come, in NYC and beyond. We welcome your input and feedback in terms of style and/or substance. Thank you for being part of the process. Beam Center’s mission is to crystallize self-directed growth in youth through ambitious, collaborative project-making. We use traditional and advanced tools, technologies, and craft to honor the individual voice, celebrate the joy of producing something larger than ourselves, and inspire lasting sense of wonder and accomplishment. Our programs support youth to take bold steps towards meaningful futures and foster conditions for educational equity. Many youth struggle within traditional school models or fail to see how their studies relate to real-world problems or opportunities. Beam Center directly addresses this disconnect by engaging students in complex projects that show the power of knowledge, science, design, collaboration, and teamwork. Beam’s Learning Productions framework provides the necessary preconditions that fuel and support young people’s personal growth while creating more accessible pathways for learning in and out of the classroom. Students apply their knowledge and skill to create something spectacular. They benefit from peer and mentor-driven relationships and they recognize that their voice and creativity matter. This combination of technical skill development and socioemotional support forms a foundation for success in school and life. We collaborate with educational and community partners to enrich the broader youth development ecosystem. Our aim is to empower young people to succeed and connect to NYC’s rich technical and creative industries. In the past year, with guidance from researchers from Columbia Teachers College and NYU, we have begun formalizing our approach in what we call the Learning Productions Model; a set of conditions, components and practices that appear in fractal form whether we work with School Leaders, Summer Campers, Teachers or Teen Apprentices. Our vision is to demonstrate that this Learning Productions Model can be transferred, adapted, and supported on a broader scale to bolster educational equity. Since evolving Beam Camp into Beam Center in 2012, we have prototyped and piloted each component of our system. 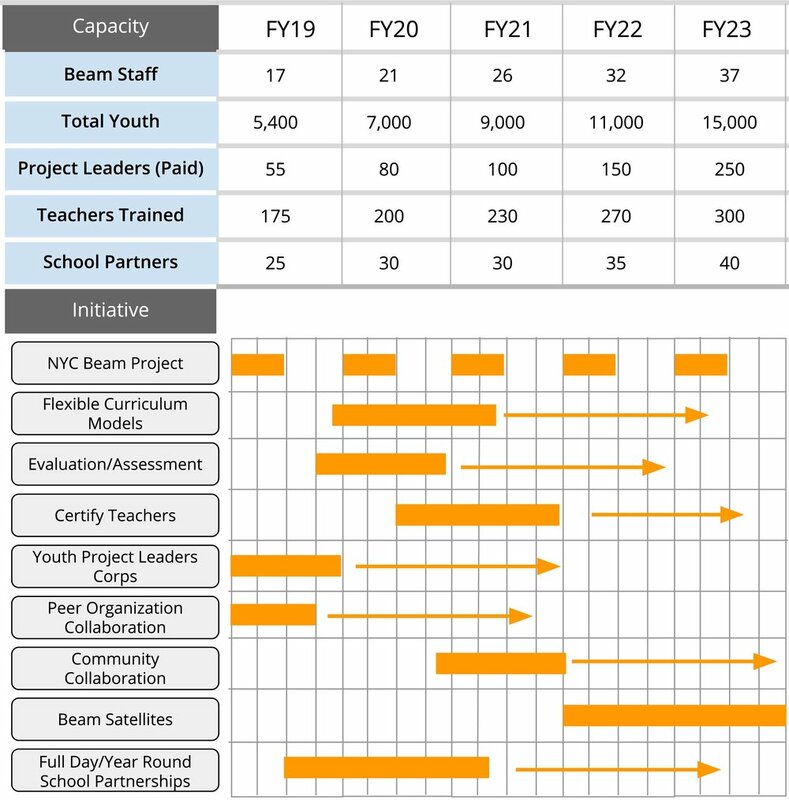 In the last 2 years, Beam has had incredible demand for partnerships with schools, CBOs and DoE Central initiatives. With this plan we intend to activate these relationships to deepen and expand Beam pathway experiences for more youth. Supported by our diverse and fast growing educator pool, more youth in more places experience our Learning Productions and make projects that express learning, enhance communities and inspire bold next steps. Adding youth to our educator pool allows us to reach scale while increasing employment for youth and maintaining a sustainable cost structure.